Happy Friday, everyone! Can you believe that we are less than one week away from Thanksgiving?! I don't know about you, but I am SO excited! I am also SO excited about today's collaboration with one of my favorite brands, Julie Brown Designs! A couple of weeks ago, I featured two looks (here and here) from her latest collection, and I am super-excited today to be sharing her ultimate retro-fabulous shift dress, the "Blaire," with you all. 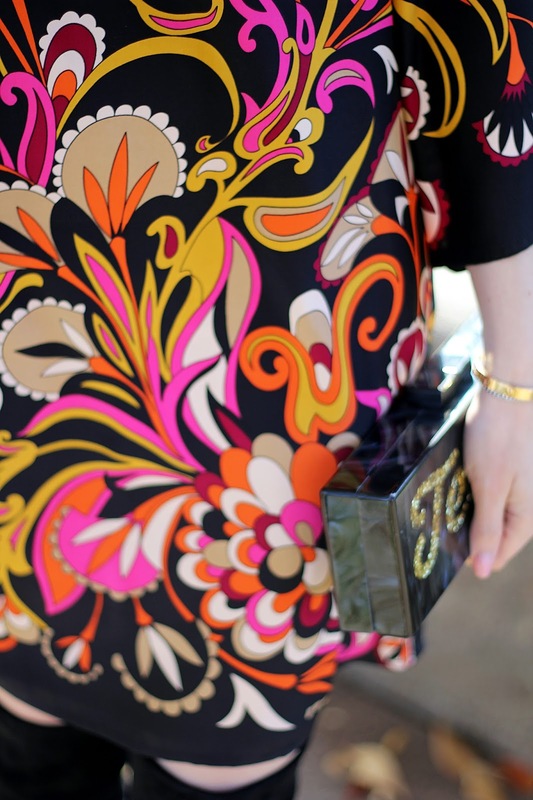 If ever there was a dress that was a perfect match for me, this would be the one; the combination of colors and vintage-inspired pattern sealed that deal! One of the many things that I love about Julie Brown is her seasonal versatility. You can see above how I styled this dress for the cooler holiday weather, but, just by changing my boots to sandals, I could easily pack this for my upcoming trip to Palm Beach in a few weeks! As if this dress couldn't get any better, we are offering it to you at a 15% savings with code "TEGGYFRENCH2016"! Cheers to that, and cheers to the weekend!